Jesus, His Mother, and a Party! A few months ago, I was listening to a Christian radio station when one of the DJ’s asked a hypothetical question. If Jesus were on this earth today, living in our culture, would he be on social media? I wasn’t sure about that one, but one of the other DJ’s said yes! Jesus absolutely would use social media as a way to connect with people. You may argue that Facebook, Google+ Instagram, etc are not the best places to really connect with folks, and I would agree. It disturbs me when people say they are closer to their Facebook friends than they are their “real” friends. Nevertheless I have found it does have some real value. Through social media I have reconnected with friends I no longer see for one reason or another and have been able to find out what is going on in their lives. Being able to pray with them in their times of need has been wonderful. Parties in Jesus day were different than ours. Hospitality was exceedingly important to them. Did you know that in Jesus’ time the party after a wedding could last a week? A week! No honeymoon for the bride and groom, but rather, they entertained for several days after the ceremony. 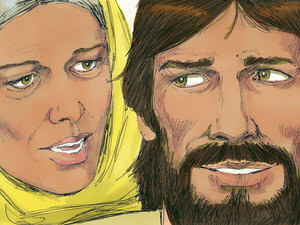 In John 2 Jesus, His disciples and His mother have received invitations to a wedding in Cana. And now the celebration is on. The host is prepared with plenty of food and wine. Or at least he was supposed to be. At some point during the days of the celebration, the wine runs out. This was a huge problem. It was not like running out of pretzels or drinks nowadays, and oh, well, will someone run up to the 7-11 and buy some more? Oh, no, this was a reflection on the host’s reputation. His lack of hospitality would be a gigantic faux pas. So Jesus’ mother Mary goes to her son and tells Him about the situation. Why would Mary do this? Why would she bother the Lord with such a problem? Take a deep breath, everyone. If you have never read this story, you may wonder why He was talking to Mary like that. His mother! I know His words have raised a lot of questions. So let’s try to answer one or two at least. As you may know, “woman” was a term of endearment and respect. Okay, that’s better, isn’t it? BUT look at his next words. “What have I to do with thee?” What? He really said that to her? Well, that shut me up. And I love it when He speaks in my vernacular. Both my children call me “mama,” and so for me the term is particularly endearing. I am totally looking at this Scripture in a new light now. Perhaps Mary is a little more spiritual than I because she doesn’t drop her jaw, make a sigh of disgust or demand that He talk to her with more respect, but simply turns to the servants and bids them do as her Son wishes. Is she recognizing His authority here? Is He somehow getting it across to her that He wishes her to relate to Him as Lord in addition to the mother-son relationship? Some scholars have said this is the case. His words probably meant far more than the English can convey. But apparently she understood his intent, and had confidence that He would let the servants know what to do. There is always more that can be said about a particular passage of Scripture, and this one is no exception. So what would I like you to take away from this? First of all, Jesus acted in a loving way to His mother; He knew how to talk to her. Secondly, you and I are not the same as Mary, and He knows that. He knows how to treat each of us and how to speak to us as individuals. Let me add one huge caution here. If you are not reading your Bible and searching for God’s instruction in His Word, it may be very difficult to hear His voice. Sometimes God may speak to us in a thought, an idea, or through the voice of a friend. But first search for His face in Scripture and through prayer. For that is where we find Him.